Best value in tablets today. Again. This year it's faster and supports Apple Pencil. iPad 2018 (6th gen) is the linear successor of last year's iPad 2017 (5th gen). It takes what was the best value in tablets, adds the Apple A10 Fusion chipset, faster LTE (if you go with the LTE model), a more coppery gold finish (if you go with the gold model), and support for the Apple Pencil, all while keeping the price the same. And that makes iPad 6 almost exactly half an iPad Pro — for almost exactly half the price. But is that enough? Paired with a Logitech Rugged Keyboard and Crayon, is that enough for kids in classrooms that are increasingly going Chromebook? With its faster chipset, is that enough for people looking to upgrade from one of the original iPads, iPads Air, or iPads mini? With Apple Pencil, is that enough for someone who wants to draw and write by hand but just couldn't justify the price of a Pro? Note: I've been using a review unit of the 2018 iPad (6th Generation) for about a week. It's substantially similar to the 2017 iPad (5th Generation), and I've been using and testing iPads since they first launched in 2010, so I'm comfortable getting this review up quickly for those deciding whether or not they want to buy one quickly. I'm going to keep using it as my primary tablet for the rest of the month, though, and I'll update this review with anything interesting or unexpected I discover regarding battery life, app performance, or Pencil use. The 2018 iPad (6th Generation) lacks the laminated, DCI-P3 wide color gamut, 120 Hz ProMotion, color-matching TrueTone display of the iPad Pro. It lacks the quad-speaker system for landscape stereo. It lacks the 4 GB of RAM for simultaneous side-by-side and slide-over apps. The Smart Connector for Apple Smart Keyboard. The 12 mp / 4K rear camera and 7 mp / 1080p front camera. And the larger 10.5-inch and 12.9-inch options. But it's almost half price: Starting at $329 instead of $649. And for that you get the same chipset as the iPhone 7 and iPhone 7 Plus (which is the same as iPad Pro, minus the X-tra cores), the same Apple Pencil support as the iPad Pro, faster LTE networking (optional), and access to the same 200,000 education apps and 1,000,000 tablet-optimized apps in the iPad App Store. it's still not an iPad Pro but many — perhaps even most? — people won't care. With these updates and at this price, it's a better value than ever. iPad 6 combines elements of iPad Air, iPad Air 2, and iPad Pro 9.7. Rather than repeat review material here, please see my previous reviews. iPad 6 is almost identical to iPad 5. Both are hybrids of iPad Air and iPad Air 2. They're both 9.4 inches (240 mm) tall, 6.6 inches (169.5 mm) wide, 0.29 inches (7.5 mm) "thin", and weighs in at 1.03 pounds (469 grams) for the Wi-Fi version and 1.05 pounds (478 grams) for the cellular version. That's the same "thinness" and weight as the original iPad Air, and 0.05 inches (1.4 mm) thicker and 0.07 pounds (9 grams) heavier than the iPad Air 2 or 9.7-inch iPad Pro. What it means, though, is that all of your accessories going all the way back to the original iPad Air will fit iPad 6 — including many iPad Air 2 accessories. It's also got the same two speaker system on the bottom. Same lack of a mute switch / rotation-lock switch. Same lack of a camera bump. Same big, plastic window on the top back of the LTE version. It's the design language that started with iPod Touch, moved to iPad mini and iPad Air, and settled on iPad Pro. And if something new is coming — something more iPhone X like — it won't start with this iPad. It'll start with the next Pro. The camera optics are the same as well, still in line with the Air Pad Air, original 12.9-inch iPad Pro, or iPhone 6. That means 8 megapixels, 1080p video out back and 1.2 megapixels, 720p video up front. It's not modern, and it's certainly not great. It'll probably be fine for occasional, casual use, including use in classrooms. That includes taking everyday photos in well-lit environments, scanning documents to digitize, and capturing image and videos for family or school projects. Also, taking and making FaceTime video calls. But it's not for anyone who takes photography seriously. Yes, even on an iPad. Touch ID on the front is also the same, first generation sensor as last year, not the faster second-generation sensor found on the iPads Pro and modern iPhones. There are a few minor differences between this year's iPad and last. 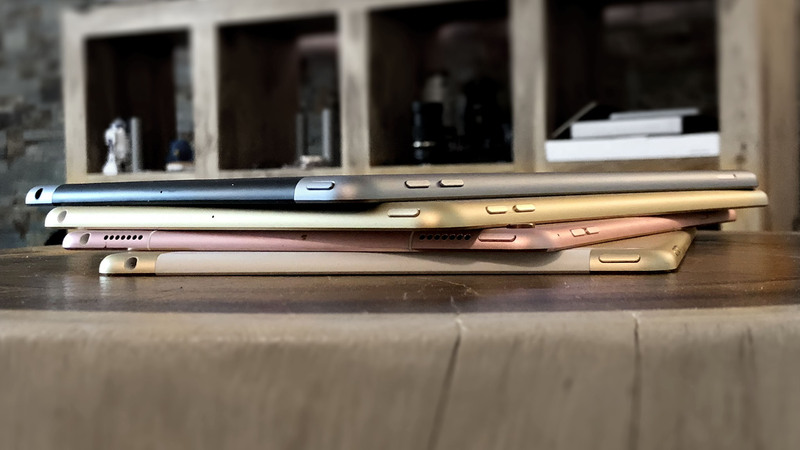 Where the 2017 model came in a champagne gold similar to the one Apple's been using since iPhone 5s, the 2018 gold is much closer to iPhone 8 — not rose so much as blushing copper. I like it. A lot. Even if it does make it tough to color-match multiple Apple products across the line... The LTE networking, if you choose that option, is also twice as fast as before. Up to 300 Mbps now. There are also two serious differences. The first is speed. The Apple A10 Fusion system-on-a-chip (SoC) in the 2018 iPad is about 1.5x as fast as the Apple A9 in the 2017 iPad. A10 Fusion came about because Apple was pushing it's high-performance silicon so far, so fast, it was starting to leave a gap underneath. So, beneath the two high-performance cores, Apple slid in two high-efficiency cores. All of that is managed internally by a custom controller so the system only ever sees one set of cores at a time. Behind the scenes, though, it assigns to right cores to the right job. If you're only watching videos or surfing the web, it won't make a big difference to you. If you're doing a lot of productivity or creative work, it'll make all the difference. The second significant addition to the 2018 iPad is Apple Pencil support. Introduced alongside the original iPad Pro, Apple Pencil combines pressure sensors in the tip with telemetry sensors and a rechargeable lithium-ion battery in the shaft to provide an experience that's both similar to but decidedly different from traditional digital stylus pens. There's no eraser on the back, which I don't miss because none of the pencils I used in art school or design work ever had erasers on the back. I'm used to drawing with one hand and erasing with a gum or white eraser in the other, which is a behavior emulated by most art apps. But the pencils used in elementary school typically do have erasers on the back — for as long as they last — so kids might end up spinning the Pencil around a few times before habituating themselves to nothing being there. There are also no buttons on the Pencil, unlike some other stylus pens and real-world art tools like the airbrush. I kinda wish there was something there to click on, even though I'm not sure how I'd use it. Switch from stroke to spray? You can charge the Pencil by plugging it right into the Lightning port on your iPad, which a lot of internet hot-takers found silly but which anyone who's used one will tell you is a life-saver in practice: If the Pencil runs dry, without even needing to find a charger, you can top it up quickly and finish your work. I've used it on planes, in coffee shops, and even when lounging around on the sofa so often. The only downside is the cap that covers the Lightning plug — it's magnetic and can stick to your iPad when charging, but it's still super easy to lose when you've popped it off. To support the Pencil, iPad 2018 has the same touch system as the 2016 9.7-inch iPad Pro. Combined with the air gap of the non-laminated display, it's not a great an experience as the original Pros, much less the current versions. But, surprisingly, it's still pretty good, and still much better than the Wacom Cintiq tablets I used for years. When I gave it to my godkids and a few friends to try — digital artists, none of them — they couldn't tell much if any difference. Especially because the capabilities, from pressure sensitivity to angle and tilt all work the same. In addition to drawing apps, Pencil now works exceptionally well in Apple's iWork suite as well: Pages, Numbers, and Keynote. You can draw into documents just like you can with Notes, but what's especially cool is the new dynamic annotation feature. Instead of markup floating in its own, static layer on top of the document, each element is separate and independently anchored to the appropriate element of the document. It's currently in beta, but just like GarageBand in the early days of iPad, iWork + Pencil shows the potential of what's the come. Logitech will also be making a Crayon for education. It won't have pressure sensitivity but it will have angle and tilt, so it'll be half a Pencil for half the price. (Sense a trend?) It'll also pair over a unique frequency, which means it won't be compatible with iPad Pro but will let teachers hand them out without having to worry which Crayon is bound to which iPad. Neat. Even though the 2018 iPad has an Apple A10 Fusion SoC, it doesn't have the A10X Fusion of the current generation iPad Pro or the new A11 Bionic that powers iPhone 8 and iPhone X, and will almost certainly power the next generation of iPads Pro. With 2 GB of memory instead of 4GB, it can do side-by-side apps and slide-over apps, but the latter will pause the former. iPad Pro can keep all of those apps alive all at the same time. It also doesn't have the laminated display of the iPad Pro, which makes it look less like the pixels are painted under the screen and more like they're embedded into the glass. Colors are restricted to the sRGB space rather than the wider gamut DCI-P3, so you don't get the deeper reds and richer greens. There's no TrueTone, so white doesn't look as absolutely paper white regardless of the warm incandescent lighting or cold fluorescent lighting of the room. And there's no ProMotion, which boosts the refresh rate to 120 Hz, not only making scrolling ever-so-smooth but making Pencil latency all but disappear. iPad Pro (tablet on the left) vs. iPad (tablet on the right) from two angles. The sound is stereo, so long as you hold it in portrait, so the two bottom-mounted speakers are firing the same way. But there's no four-speaker system that dynamically maintains stereo sound no matter which way you rotate or hold it. There's no Smart Connector, so you can't use Apple's Smart Keyboard, which I live by on iPad Pro, or any of the Smart Connector-equipped Logitech keyboards. So, Bluetooth keyboards are your only option. The cameras, being 8 MP and 1080p and 1.2 MP and 720p are also a far cry from the iPad Pro's more magnificent 12 MP and 4K (2160p) and 7 MP and 1080p cameras. The 2018 iPad does get the same image signal processor (ISP) as the current-generation iPad Pro, though, so you have the same object detection, auto focus, white balance, and iso, and all the other bells and silicon whistles. And, of course, size is limited to 9.7-inches. There's no 10.5-inch or 12.9-inch option for those who want a bigger tablet experience. iPad works with iOS 11 — currently iOS 11.3. It includes a variety of built-in apps for everything from web browsing to mail, photography to ebooks, maps to movie-making. 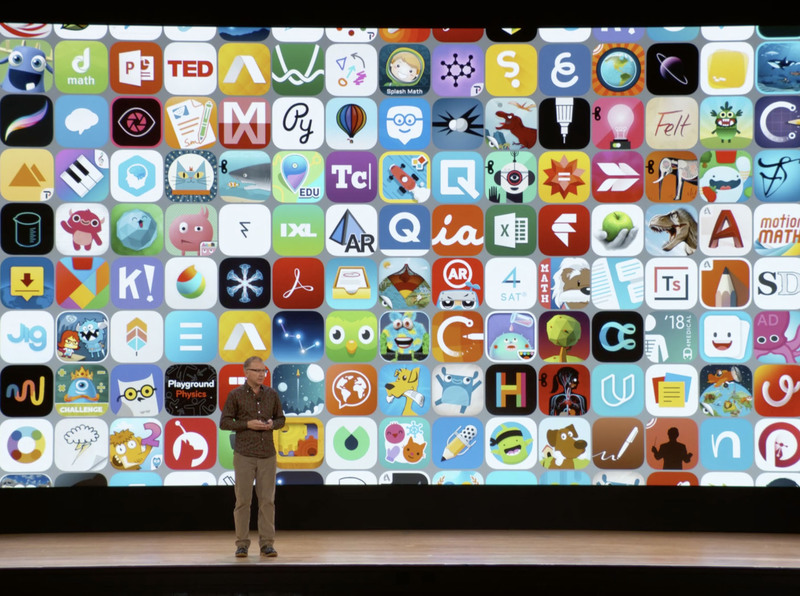 It also works with the over 1 millions iPad-optimized apps in the App Store, which turns iPad 2018 into... just about anything. Before the original iPad launched, there was a rumor that it would cost $1000. During the iPad introduction event, Steve Jobs revealed the actual price to an "unbelievable" $499. Newer versions of the 9.7-inch iPad, from iPad 2 to iPad Air 2, all kept the same price point, even as older versions hang around at $399. The 9.7-inch iPad Pro raised the cost of entry to $599. iPad 6 — like iPad 5? Yes, you're getting what you pay for. And that means a display straight out of the original iPad Air — not laminated like iPad Air 2, not TrueTone like iPad Pro, and certainly not DCI-P3 and ProMotion like iPad Pro 2. The camera system is from iPad Air 2, not nearly as impressive as the 12-megapixel / 4K and 7-megapixel / 1080p camera system of iPad Pro 2. The chipset is better: the same A10 Fusion found in iPhone 7... but it's not the A10X Fusion found in iPad Pro 2, with double the memory and graphics punch. It has Apple Pencil support, which used to be an iPad Pro-only feature. But it doesn't have Smart Connector support, which remains an iPad Pro-only feature. It may have only half the features of iPad Pro but it's very nearly half the price, and if you don't need any of those extra features, that's a significant savings. Even and especially with Apple Pencil added to your cart. By all means, if you want an iPad Pro or a Mac, get an iPad Pro or a Mac. But for students in and outside the classroom, for people looking top upgrade from an original-style or Air-era iPad, or for those who just want Pencil support without the full Pro price, the 2018 iPad Pro, Apple's 6th Generation, once again delivers the best value in tablets today.